Note: If you are participating in a Giving Day - a one day 24 hour giving campaign - head on over here. 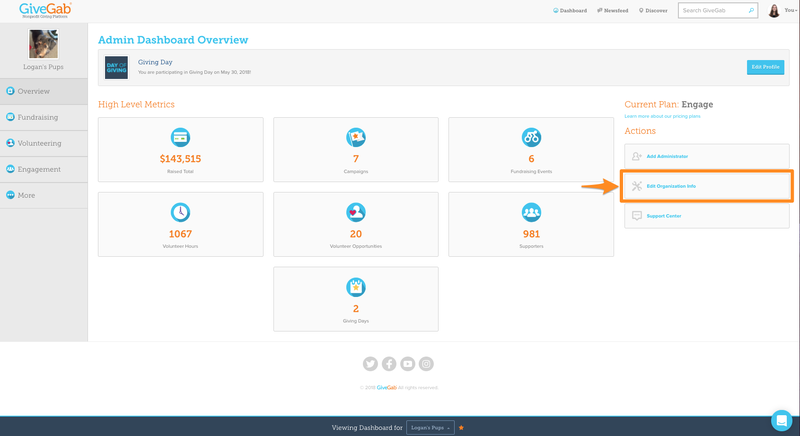 From the "Overview Tab" of your Admin Dashboard click the "Edit Organization Info" button on the right hand side of your admin dashboard. After you click "Edit Organization Info" you'll be directed to this page that says "General Info" at the top. After you add or edit any of the information on this page click the "Save Changes" button at the bottom left corner for them to be reflected on your GiveGab profile.